Custom stadium cups is probably one of our cheapest promotional drinkware product. Don't be fooled by its low prices however, instead be impressed by it! How is it that such nice quality made personalized plastic cups can be priced so economically? Well, first of all, at Promotion Choice, all of our products are quality items priced at rock bottom prices, and that is why we have so many returning and loyal clients. Also, these personalized stadium cups are made right here by a manufacturer in the United States, so we save lots and lots in shipping and other import fees. Because we are one of the largest sellers of these cups, we are able to purchase them in bulk wholesale prices and in turn pass on the savings to our clients. The end result is a quality made printed plastic cup printed with your logo on an generous imprint area to help you with your marketing needs. Best of all, these cups come in many many different colors – black, white, several blues, greens, red, pink, purple, frosted, clear, and even in neon and metallic colors. You will never run out of colors to choose from with us. We also match pantone colors at no additional charge, so if you are an organization who is very particular about your logo color(s), don't worry! We can match your colors so long as you tell us correct the Pantone number. Logo stadium cups are a staple of the promotional products industry for a good reason. It is economical, attractive, robust, reusable or disposable, and best of all, it is so flexible in how it can be used. A huge majority of our customers order it for sporting events, tailgates, beer festivals, and many other social activities. But others order the imprinted stadium cups for personal affairs such as weddings, birthday parties, poolside parties and other fun summery activities. Others have some surprising uses for these cups – they may order them with lids without straw-holes and simply use them as containers, and some casinos may even order them as containers for holding casino chips! There are endless creative ways you can use or promote your event or company with custom stadium cups. Not Just Colors But Different Style Varieties of Promotional Stadium Cups! 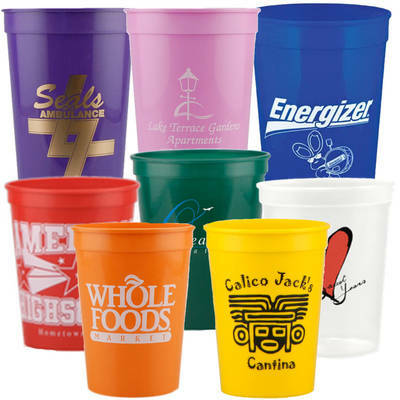 At Promotion Choice, we have a large inventory of stadium cup style choices. We are not content with just providing you with the standard cups, but are constantly updating our inventory so you can choose the cups that will fit your unique needs. Besides smooth walled branded stadium cups, we also offer print fluted stadium cups, the “magical” mood stadium cups that changes color completely when you add a cold beverage to the cup, as well as translucent or jewel toned stadium cups. Over time, we will even be adding more styles such as casino cups, which has a wider base instead of one that tapers down, cups with a smaller base so they can fit within the cup holder of a car, and even glow-in-the dark custom plastic cups! Check back often to see our ever increasing inventory of promotional stadium cups! We also sell custom stadium cup accessories like lids, straws, and straw tips. The lids and straw tips come in a variety of colors, most often in Black, Red, Blue, or White. Get these accessories to help spillages at events. Give them out as a set to your customers, and they will be much more inclined to keep these great mementos so they will constantly be reminded of who you are and what your brand is about. With our unmatched rock bottom pricing, you are getting more than what you pay! Our cups are not cheap poorly made cups, but quality locally made quality cups. The plastic material is non toxic, Bisphenol A (BPA) free, and FDA approved. These personalized plastic cups go through tight quality control procedures so that you can receive a good robust logo stadium cup for your promotional needs. And because they are bought and sold in bulk, they are also made from recyclable plastics, so if properly disposed of, these cups can be recycled instead of ending up in land fills. To top it off, our imprinted stadium cups are of such high quality that they are top rack diswasher safe, so even restaurants can use them to serve beverages! For just a few cents each, these logo stadium cups will really go a long way for you!